Soak split bengal gram for about 30 minutes. Par boil all three dals/lentils. Take a kadai and heat ghee. Add cumin seeds, red chilly, asafoetida, curry leaves and stir it for 2-3 times. Add green chillies, ginger-garlic paste, spring onions and saute it for about 5 minutes. Add par boiled dal, salt, turmeric powder, lemon juice and let it simmer for about 8-10 minutes. 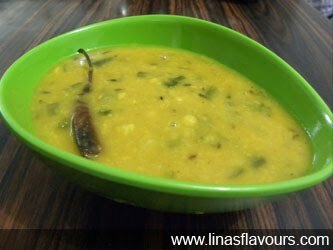 Serve it hot with jeera or plain rice.